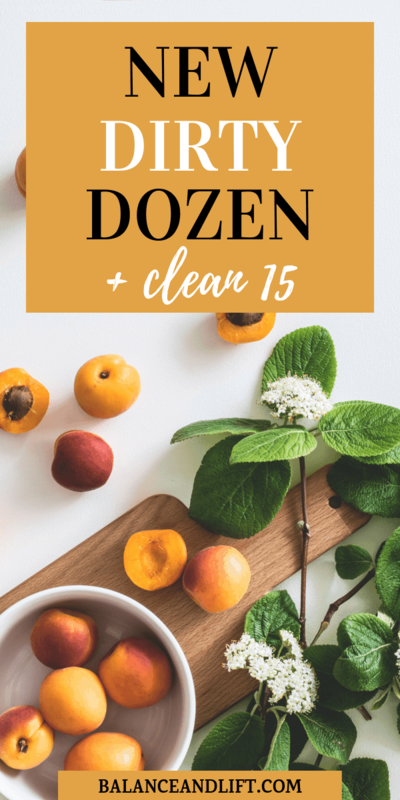 The new Dirty Dozen and Clean 15 lists have been released! A big part of healthy eating is being aware of what you are putting in your body – and pesticides are no different. Buying organic can be difficult – and can also get really expensive. Luckily, it is not necessary to purchase all your fruits and vegetables organic if you want to avoid the nasty synthetic pesticides. The Dirty Dozen and Clean 15 list (updated for 2019) ranks the produce based on the most (Dirty Dozen), and the least (Clean 15) amounts of pesticide residues. 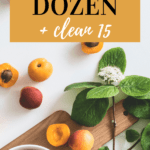 What Are “The Dirty Dozen” and “Clean 15” Lists? The Environmental Working Group (EWG) is a non-profit and non-partisan organization dedicated to fighting for consumers’ rights to live healthier lives and in a healthier environment. Each year, the EWG release their “Shopper's Guide to Pesticides in Produce™”. You may know it as the “Dirty Dozen” (1) and “Clean Fifteen” (2) list. The Guide is updated every year and was started in 2004. It ranks pesticide contamination for 47 popular fruits and vegetables in the US. While the EWG studies 47 different types of fruits and vegetables, the guide is produced based on the results of over 40,900 samples! The produce is tested by the U.S. Department of Agriculture and the Food and Drug Administration, and the results of those tests are analyzed by the EWG. The tests for pesticides (which is now found in almost 70% of produce in the US) are conducted on samples that have been prepared to be eaten – i.e. after they have been thoroughly washed and (where applicable) peeled. This is done to mimic how the fruits and vegetables will be eaten by you – the consumer. The results are then distilled in an easy-to-use guide that you’ve come to know as the Dirty Dozen and Clean 15 lists. The list is not perfect – the USDA data tends to be inconsistent as the fruits and veggies they test every year varies, and so do the chemicals they test for. (For example – Kale is back on the Dirty Dozen foods list, but it hadn’t been tested since 2009). But it does provide helpful suggestions for those wanting to avoid pesticides as much as possible. The long-term effects of exposure to pesticides are not definitive at this point, but studies have indicated that it may cause a variety of health problems. “Studies have shown that eating fruits and vegetables free of pesticides benefits health, and this is especially important for pregnant women and children,” says EWG Research Analyst Carla Burns. And since 2012 the American Academy of Pediatricians Council on Environmental Health has been encouraging the exposure of children to pesticides to be limited as much as possible. Exposure to pesticides during pregnancy and during early childhood has been found to increase the risk of brain tumors, leukemia, neurodevelopmental defects, and various other adverse birth outcomes. According to the Department of Agriculture’s National Organic Program, “organic” is a designation to certificate that food was produced without synthetic chemicals or fertilizers, genetic engineering, radiation or sewage sludge. It is important to note that not enough is known yet about pesticides in general – even organic pesticides. If a food is organic, it doesn’t mean that no pesticides were used at all, it just means that the pesticides weren’t synthetic. Organic farms use third-party validated pesticides, and at this point, there isn’t a certainty as to whether organic produce provides less (or more) risk than conventionally grown produce. Dirty Dozen produce is a good base for a list of foods to buy organic. Kale was on the list for the first time in 10 years – and ranks third. Avocados and sweet corn had less than 1% of samples showing detectable pesticide, and more than 70 percent of fruit and vegetable samples on the Clean Fifteen list had no pesticide residues. This means you can feel comfortable purchasing conventionally grown fruits and veggies from this list. EWG uses six different measures of contamination and combines them to come up with one final score for each of the types of produce. They then present the data based on the fruits and vegetables that consumers are most likely to purchase. When EWG lists “Sweet corn”, for example, this includes both corn on the cob as well as frozen corn. Percent of samples with two or more pesticides. Average number of pesticides on a sample. A maximum number of pesticides found on a single sample of produce. The total number of pesticides found on the whole crop. The guide is based on samples available to US consumers. Both domestic produce, as well as imported produce, are tested to see what levels of pesticides are present. The results of imported and domestic fruits and vegetables are combined into one score unless the results between them are drastically different. While EWG recommends purchasing organic versions of fruits and vegetables on the Dirty Dozen foods list, if these options are too expensive or not available, they recommend for consumers to continue to eat fresh produce. The goal of the EWG is not for you to completely stop eating non-organic foods from the Dirty Dozen list, but to give you the information needed to make informed decisions in the store. And remember – no matter if your produce is organic or conventionally-grown – wash your produce well before preparation and eating.